The JBL AM5212/00-WRC Weather-Resistant Speaker is a lightweight, 2-way medium power loudspeaker system that features the JBL differential drive dual voice coil and dual magnetic gap 262H-1 12" low-frequency driver, and the 2408H-1 high frequency 1.5" exit, 1.5" voice-coil compression driver. A 100° x 100° coverage pattern is provided by the large format PT-H1010HF-1 Progressive Transition waveguide. The loudspeaker system can be used in either vertical or horizontal orientation. The heavily braced trapezoid birch enclosure has a DuraFlex finish and is constructed to maximize low-frequency performance. 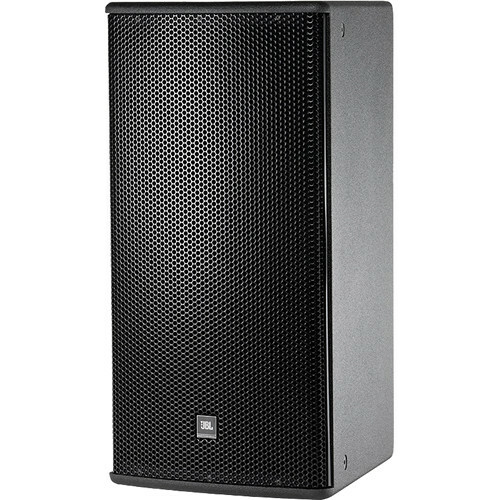 This speaker is part of JBL's AE Series, a versatile family of loudspeakers intended for a wide variety of applications, which includes but is not limited to: performing arts facilities, theatrical sound design, auditoriums, worship facilities, live clubs, dance clubs, sports facilities, and themed entertainment venues. Box Dimensions (LxWxH) 34.0 x 25.0 x 21.0"